a year ago… | Blooming Joy! I had just moved downstairs, from the ante-partum wing of the hospital to the birthing floor. They were prepping me and starting the process for inducing labor. I was uncomfortable and stressed and worried enough about the impending birth of my daughter that my already-high blood pressure started to skyrocket. Travis had just gotten back from Ash Wednesday services at our church, and I had a new set of nurses to deal with. I had gotten so used to the nurses upstairs after four-plus weeks in the hospital. By this point I was already used to having the fetal heart monitor strapped on for about an hour twice a day. Now I got to wear it and the contraction monitor full-time. And it was scary, because Samantha was stubborn. She HATED the monitor and would constantly move away from it. Every time her heartbeat faded I would panic. Ugh. Ironic now, isn’t it? I know I slept that night, but I also know it was harder for me. The beds are much more uncomfortable downstairs, because they are designed to come apart for giving birth. Plus upstairs I had an air mattress topper that helped make things more comfortable. The biggest thing for me that night was just being scared. I was scared of giving birth. I had already given birth, so I don’t know what was so scary for me. The next day, things did NOT progress at all. My body was not prepared to give birth, and no matter what they gave me via IV, my body still wasn’t ready. And my blood pressure kept climbing. So the doctor came in at about 1:00 and offered me a choice: keep going and wait for my body to kick into gear, or do a C-section. She left for a few minutes to let us talk, and we cried and shared our fears and ultimately decided to go ahead with the C-section. My doctor came back in and said that she was glad we decided that, because she was going to push for it anyway. And things moved really fast after that. Prep, rolling down the hall, spinal block, and from that point I wasn’t quite sure what was going on. But suddenly I heard them say “1:55” and then heard my daughter cry. It was the most beautiful sound in the world. After the initial weighing and cleaning up, Travis brought Samantha over near my head so I could see her up close. She was perfect, tiny, and beautiful. 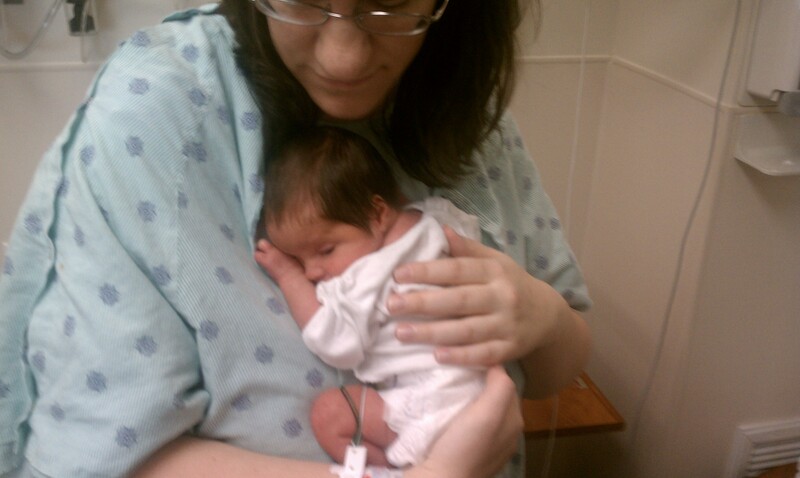 And then he carried her to the NICU (she was 6 weeks early) and I was taken back to my room. It was the last time I got to see her that day, but Allison and Travis took a bunch of pictures and a video in the NICU and brought them back to me. The problem was I was exhausted, my blood pressure still wasn’t normal, and I felt sick from the anesthetic. And because of my incision, I was desperate to not throw up. Meanwhile, the lactation nurse came in and pushed me to start pumping. I understand why now, but at the time I just wanted her to go away. I was hormonal and grumpy and feeling sick. I think if I had been able to try nursing my daughter at that point it would have been easier. Holding a baby to nurse is so much different than pumping. I had that confirmed when Samantha was in the PICU after she got sick. What is weird is that Samantha’s birthday is the only day of her life I didn’t hold her in my arms. Go figure. And the next morning, I got up and got into a wheelchair. We went down to the NICU, and we were turned away. It killed me. I wanted to get it, wanted to meet my daughter. Unfortunately, another baby in the NICU was having trouble and was in surgery, so no one was allowed in. It wasn’t until later that morning that I finally got to hold my daughter. I remember being so terrified to hold her in my arms. She was so tiny, and there were so many wires attached to her. Little did I know that we would be dealing with wires and tubes for a large percentage of her life. I miss so many things, but the biggest thing I find myself missing is the feeling of her on my chest, sleeping against me. We spent so much time during those last six weeks of her life just holding her. I know so many parents don’t get the time to just hold their children, but then those parents get a lifetime with their children. We had to squeeze a lifetime of holding into a few short months. I can’t believe it’s been eight months since she left us. She’s now been gone twice as long as we had her in our lives. To look at our lifestyle, it’s as though we never had a child. We have two dogs, stay up late, cook and travel and work and do all kinds of things that were so much more challenging with a baby. Yet internally, EVERYTHING has changed. We are different. Samantha changed us in so many ways. One of my nieces asked me the other day if I miss Samantha. My answer was, “every day.” I miss her all the time. We both do. We trade off crying and feeling sad and wishing we could be with her. Sometimes I’m down and depressed. Sometimes Travis is. Sometimes we both sit in silence and cry. I’m not looking forward to tomorrow. But it’s going to come whether I want it to or not, so we’re spending the day with family and friends. I hope it will be ok, but I’m going to allow myself to take a time out and cry if I need to. No one is going to mind, I think. Today I mailed off some of my maternity pants. The rest of my maternity clothes I’m going to take to a local crisis pregnancy center. I want to know that someone else can have some use out of those clothes, because I’ve decided not to try to get pregnant again. That decision gets stronger and stronger every day. I don’t know if we’ll ever decide to pursue adoption or not. If we do, it will be God-ordained, just like Samantha’s life. But for now, I’m just going to keep doing the work I have in front of me, and deal with missing my little girl. I’ll be thinking of you guys all weekend, praying for you and missing Sam along with you. It’s so hard to believe it’s been a year. Beautifully said, I’m at loss ofwords, however I wish for you to print this so as the days get harder to remember then you’ll have this to look back on. Love to you and Travis. You honored Samantha so well when she was with you, and you honor her so well now too. We see so much grace in how you live out your days. I will be praying for you both tomorrow. We are keeping you in our prayers. Although we’ve never met, we loved that little girl too. She was in our prayers before she was born. That was beautifully written. Thank you for sharing what’s on your heart. Keeping you guys in my thoughts and prayers. My heart is aching for you and your family tonight. I read Allison’s post earlier this evening. Thank you for your witness, and pouring of emotion. We will continue to pray for you and your family that God would wrap his arms around you tomorrow to give you strength for each moment. I am truly sorry that you have had to bear all this sadness. I can’t say I know how you feel because I don’t. I had one miscarriage and the other four babies I still have with me now. Two of them live very far away and so I don’t get to see them very often at all and that is sort of like losing them. I don’t get to see my grandbabies and I mourn in my own way about not getting to see them and they don’t know who we are. Please forgive me for my going on about these things. Let me go back to saying that I am glad you will get to see your children again some day. We will meet all our children again in heaven. I am praying for you and Travis for blessings for tomorrow. I am glad that you will be spending time with family and friends tomorrow. I know that they will understand if you have to cry. Give it to God and he will comfort you. Coincidental, ironic – I think of it as God merely showing us more about His ways, showing us more that we shall never understand. Twenty-two years ago tonight, also a Saturday, I had been sleeping for a while and Peg woke me up, just before midnight. About 2:30 am on the next day, Sunday morning, we were headed to the hospital. At 12:30 pm, Madison made her entrance into the world. Knowing you and the lives of your children (remembering that they are still alive, perhaps more than we are) helps me more than you know in loving and fathering all five of mine. Joan turns 42 in May, Jamie is 40 in July, Molly is 34 in August, and Luke turns 32 next month, And Madison. Tomorrow. The little girl I got to hold on the same date you first held your little girl. Your friendship reinforces the rightness of loving our children. For all of their life – long, short, in-between. There’s an old song from the early 60’s (dinosaurs like me remember such things) – “You Don’t Know What You’ve Got, Until You Lose It.” More tragically today, though, I see so many parents in the store or at a restaurant who don’t know what they’ve got – yelling at kids, spanking kids, calling them stupid, pouting at them. I am old and gray enough that I should have the right to go up, slap and shake these people and tell them to get their head out of themselves and into their children and God’s love. I wish your story were simple and less painful, even for me, to relate to others. If they only understood how they are blessed. If they only knew what God has shared with them. You and Travis do know. You know better than many. It’s simple things, like passing on your maternity clothes to the crisis pregnancy center, that express the blessings you are passing on from Sammy. It’s the gift of understanding that the Spirit is sharing through our friendship that blesses even this old man who usually thinks he knows everything. “That’s how it is with God’s love: Once you’ve experienced it, You spread His love to everyone, You want to pass it on.” You’re doing great, kid. Thank you for passing it on to me. Hopefully I can reflect some of His comfort back for you. Very well written, thank you for sharing. Praying for you and Travis. Michael and I are thinking bout you and praying for you. I think and pray for you guys often and imagine samantha and jonah rejoicing together in heaven. I think your post is a lovely recollection and the picture is beautiful beyond measure.